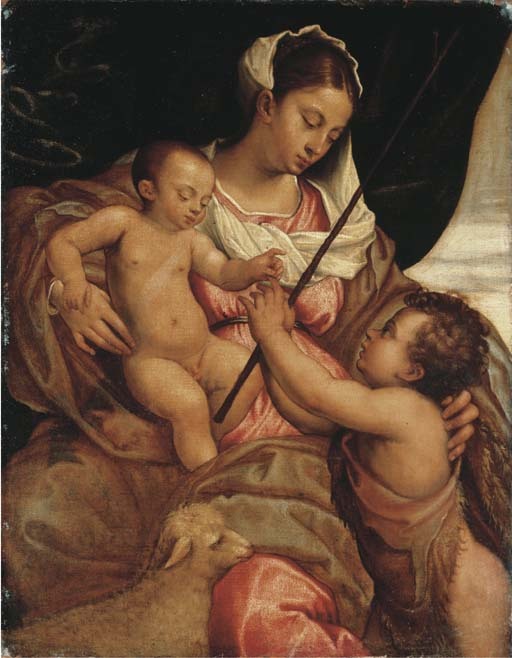 This composition relates to The Madonna and Child with the Infant Saint John the Baptist, circa 1542, by Jacopo Bassano in the Galleria Palatina, Pitti Palace, Florence. We are grateful to Professor Roger Rearick for noting that this picture is one of a number of versions of this composition that he has attributed to Jacopo's son, Giambattista (1553-1613). Judging from a photograph he describes the present work as being of 'strong quality'. We are also grateful to Professor Alessandro Ballarin, and to Dr. Bernard Aikema, who on the basis of photographs, have both separately confirmed the attribution to Jacopo's studio.